Because you love your car! We have all your janitorial cleaning needs. Clean, clear & spotless dishes every time. Our staff is equipped with over three generations of knowledge in the chemical manufacturing industry. Business has to be a win, win for both parties; therefore we make sure that your satisfaction is our priority. We provide top quality and innovative products to give your business that leading edge over the competition, and keep that repeat business coming back. Precision Chemical Manufacturing Ltd. has been in business for over 30 years. We have prided ourselves on our high quality products, but as well as the service we provide. Our customers are not "just customers", we have kindled a strong personalized relationship will ALL our clients. Precision Chemical Manufacturing Ltd. manufactures our cleaning compounds in house. By doing so we are able to cut out the middle man, and provide high quality products for less. Precision Chemical Mfg. is also able to provide customers with private chemical compounds unique to their situation. Precision Chemical Manufacturing Ltd (1979) is a family owned and operated business, that strives on customer service and support. We are located in Edmonton, Alberta, Canada, and carry a broad line of Industrial, Janitorial, Car Wash, Laundry, and Warewash supplies. Precision Chemical Mfg., works with many different suppliers to ensure that you the customer gets the very best product for your dollar, while ensuring only the highest quality of service and customer support. Since 1979, Precision Chemical Mfg. Ltd. has been providing our customers with superior cleaning products that are priced to fit your budget and all your cleaning needs. We pride ourselves on our exemplary customer service. Its the cornerstone of our business and an ingrained trait that has been passed down through three generations of this family owned business. 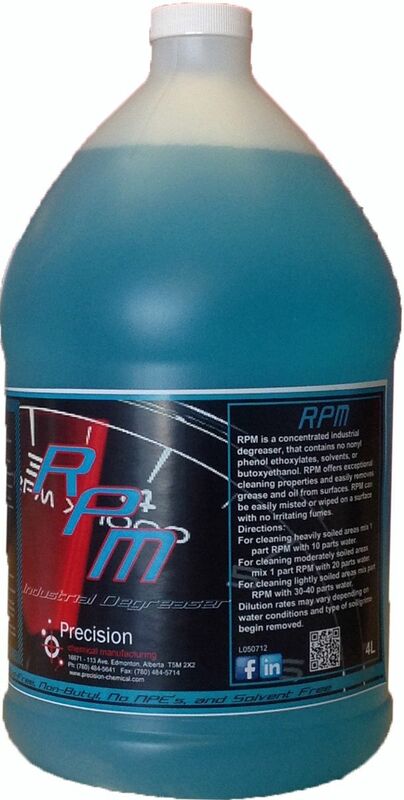 An environmental cleaner and power wash detergent to quickly cut through grease and oil.